"Rarely have I ever seen such strong encryption as RakEM has - I use it every day." Ever wanted to unsend a text or picture? RakEM has developed a state of the art way for you to delete whatever you have sent from your friend’s device. If you wrote it, you can delete each message from your friend’s phone at any time. Ever want to get rid of all conversation history forever? With RakEM’s Total Recall feature you can also permanently delete entire conversations from the devices of both parties involved. One tap and your conversations are gone forever. Tap to communicate – securely and privately. RakEM Technology is complex and you don’t even see it. Device-to-device direct communications (no servers) with the highest levels of self-mutating encryption covering voice, video, text and files. Some companies say: ”We would rather fold the company than give out your content”. But would they? Some companies say: ”We delete your communications from our servers”. But do they? RakEM has nothing to give out, RakEM has nothing to delete. We do not have your communications, you are safe with RakEM. Nowhere else can you retract your word! You wrote it, you can delete it in your device, and also in your friend’s device. 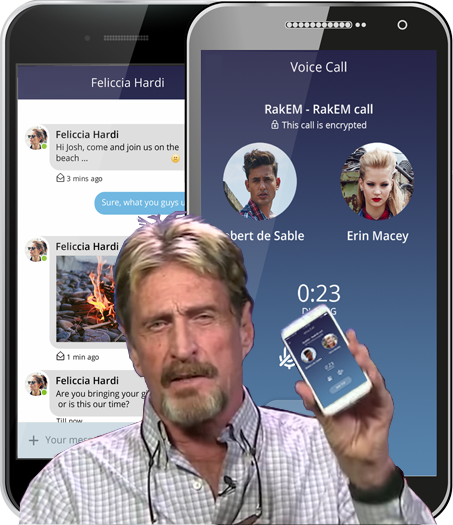 No other messenger application today provides you with as much control and security as RakEM does. Since RakEM uses no servers, data mining your conversations is not possible. RakEM gives the control back to you, never storing your data.